HONNNNNNNNNNKKKKKKKKKK!!!! Phwoosh phwoosh phwoosh. Cars were whizzing past, so close that you could feel even small economy hatchbacks as they sped on by. I was on the side of a major highway, with barely any shoulder to speak of, and my car couldn’t move. I had a flat tire, and my first call was to 911. I’ve already said a lot of things that need some explanation, I know. You shouldn’t, ideally, need to call anybody when you get a flat tire. Just pull over, pop off the bad tire, pop on the spare. Yeah, your day is probably going to be considered crappy, but that’s about it. “Oh man,” you’ll exaggeratedly sigh to everyone you meet, “my car had a flat!” Then everyone consoles you, you drink heartily from the chalice of sympathy, and you milk it as an excuse to show up late to everything for like a week. Well, that’s how it’s supposed to work. That’s not how it worked for me last Saturday night. My wife, Olga, and I were headed back from a wedding on City Island in the Bronx in our 2002 Lexus IS300 Sportcross. If you’ve never been to City Island (and why would you, it’s entirely out of the way from everything even for people who live in New York), it’s actually really lovely. It’s like a small exclave of maritime New England, right in the Bronx, with the added bonus of being right across a small channel from New York City’s “Island of the Dead” where bones occasionally wash up on shore. I may sound like I’m intentionally digressing from the main story at hand, here, but trust me, we’ll get to it. The drive from where we live in Brooklyn to City Island was an uneventful one, with the usual dodging of the region’s cavernous pot holes, but nothing else. Everything was fine. Shortly after we set out for home, still on City Island, something felt off. Not in the way like “hooo boy, got a flat tire!” off. More like when you drive over a drawbridge, or a grooved road. Is that a wriggling in the steering wheel? A little tug? But like I said, New York City’s roads are awful. A little funny sensation, almost imperceptible in the wheel is pretty much the standard driving experience here. That’s just what the roads feel like. There was no fwap fwap fwap fwap fwap fwap from a flat tire. No shaking, nothing to even call a “vibration.” The car was an absolute peach on the drive up, so there was nothing to worry about, I thought. Pictured: My car on a normal, happy day. And me pointing at it like a big dumb goof in a silly purple sweater. The offending tire can be seen, before its untimely demise. I don’t know who that other person is. Still on residential streets, I pressed on, and by the time we got on the highway, everything felt fine. For about five minutes. Because five minutes after we got on the highway, all hell broke loose. There was a clunk. There was what felt like a sharp knock that seemed to emanate from under the car, right in the middle, where the driveshaft would be (I later realized this was probably just debris hitting the underside, but in the moment, I had no idea what it was), never a good feeling. The car seemed to heave up and down, a death throe if I’d ever felt one. I had had flat tires before. I’ve had major blowouts before. This didn’t feel like any of those. When the drama started we were in the middle lane, and I lurched the car over to the right lane. We were on the Bruckner Expressway in the Bronx, one of the busiest highways in the city, and there really wasn’t a shoulder at all. There was a small patch, maybe three feet wide, and I shoved the car into what little space there was. I had to do it soon, as after that, there was no shoulder whatsoever. Just the lane and a concrete wall. If the car was going to come to a stop anywhere, it was better there than the alternative. But still, it was bad. It felt like my car was hanging halfway into the right lane. You really could feel the cars whizzing past, getting menacingly close, almost as if they were trying to express rage at the idiot who decided that yes, here, halfway into the lane of a major highway, was a good and proper place to park. I knew it wasn’t good. I knew that with my car hanging out into the lane like it was, the car was a sitting duck. Someone could miss us in the dark of night in a blue car, and hit us. Or worse, they could encounter target fixation, and see us so much that they smacked right into us from behind at 70 mph. “Oh my god,” Olga said, and shoved her phone out the window. She snapped a picture, and I immediately knew what I was looking at, but I couldn’t quite process it. Most of the car was where it was supposed to be. But the right rear tire was not. It was sticking out, somehow attached to the car but not. My mind wanted to race, trying to think of what could’ve caused it, but knowing what the issue was and knowing that a desperate move wouldn’t kill us, I cut the steering wheel as hard as I could to the right, and got the car to drag itself over as much as it would go towards the concrete barrier and get out of the highway lane, like someone who was recently shot in a leg crawling out of oncoming fire. But the car was still hanging out into the lane. I am loathe to be the sort of person that causes a traffic jam, as there is no greater purgatory on Earth than that, but it wasn’t safe. There was no other choice. The tire could get fixed, but to do that I’d have to be able to open my door. And with no real gaps between the oncoming cars, it wasn’t possible unless I wanted to be a red smear on a dilapidated highway in the Bronx. I didn’t like my chances with the NYPD, frankly, and we were still sitting ducks. So I called AAA. Even if I didn’t need a real tow, they could send a huge truck with lots of flashing lights. If I was real lucky, they’d even have some road flares. “The truck will be there in 15 to 20 minutes,” I was assured. I knew that “15 to 20 minutes” in a tow truck tends to mean somewhere between five and six hours, so I told Olga, mostly to re-assure myself, that a cop would be pulling up behind us any second now, and we’d be out of the jam. Five minutes passed. No cop. Ten minutes passed. No cop, no tow. I was constantly checking my mirrors, looking for both any semblance of flashing lights, and for the harbinger of death that would send us into the afterlife in the form of a big Mack truck that didn’t see us. “I see the incident being logged in the system, sir,” was the best the 911 dispatcher could tell me. I wanted to scream at them to send an ambulance, too, as we would need one by the time any emergency services got there, but I knew it wouldn’t do any good. The car couldn’t move. I couldn’t open the door. We were stuck, and pretty much the only thing left to do was pray we didn’t get hit. There was a sign for an exit about a half a mile away, but it was too far with the car barely able to move. Finally, 15 minutes after the ordeal started, yellow flashing lights appeared over the hill behind us. The tow truck was here, in what seemed like miraculous and incredible time, for a tow truck. The driver was a nice guy, who sheepishly explained that because it wasn’t a flatbed tow and because it was the rear tire that completely came apart, he couldn’t do much. He couldn’t even change the tire for me on the side of the road even if that’s what I wanted, as it was against his company policy. It didn’t matter. I could do it myself. With the truck blocking traffic, it was just a matter of grabbing the spare out of the back, swapping it, and driving on our merry way. It was bewildering. The tire wasn’t flat, it was just gone. And it wasn’t a tread separation, either. It was more like the tire had completely unzipped itself along the sidewall. By the time I got home I realized that I’d picked up a nail at some point on the drive, and must have been driving on the slowly-deflating tire long enough for it to basically unzip itself. Some days later, I contacted Bridgestone, the company that made these tires. I’m a journalist, after all, and I wanted their expert opinion. In short, that wiggling I felt was the tire going flat, and driving on it tore the thing open at the worst possible moment. But that’s what I learned after the fact. Standing on the side of the Bruckner, it wasn’t time to ponder the mysteries of the universe. I swung over to the trunk, grabbed the spare, the jack, and the tire iron and went to work, happy to finally be making some progress. Lowered the car back down, and now I had a new problem. The spare itself was flat. I bought the Lexus back in December. When I bought it, I thought I had checked everything. It had everything you wanted, including a full-size spare. I, like an idiot, didn’t look at the spare as carefully as I could. But when I needed it most, it could’ve let me down. I could’ve let me down. The tow driver was sympathetic. He would follow behind me, driving on three good tires and a flat spare, for the half mile or so it took to get to the next exit and the gas station on the corner. It was better than being stuck there. Thwap thwap thwap thwap thwap thwap thwap, the flat tire slapped against the ground as we drive along carefully. And while that was enough to ruin anyone’s day, it was music to my ears. As long as we were moving. We got to the gas station, put air in the spare, and somehow it was holding. 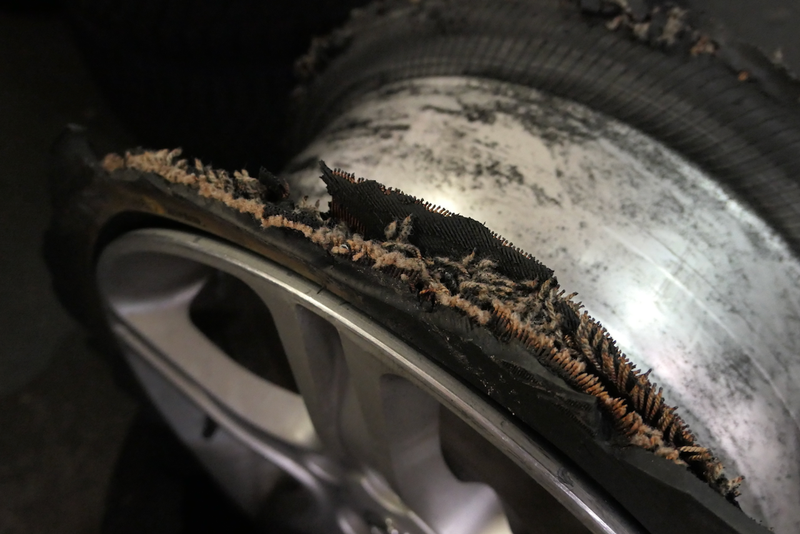 The shredded tire after I got home, with the wheel atop it. If you notice, the tire is still technically attached to the wheel. Well, a small part of it is. We decided to take local streets all the way home, just in case, the 45 minute trip turning into a three-hour trip. But it didn’t matter. That was the weirdest flat in my life, and we were safe. After about an hour, my phone rang.